Female receptacle housing and insert pre-assembled. Contacts have to be ordered separately. The MiniCon with its flexible and compact design is perfectly suitable for multipin / industrial applications. 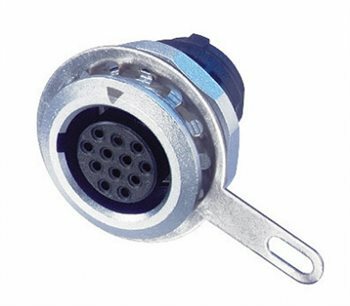 The rugged all metal miniature connector offers a push-pull locking device and stands out by its cost performance ratio. Easy assembly: Contact soldering/ crimping in disassembled condition avoids awkward wiring of high density contacts. Up to 12 contacts selectable. The male and female insert can be assembled in the cable connector and chassis housing.